At our school, we value giving feedback during our learning so that we can help each other progress with our learning. We call this process 'Peer Critique and Multiple Drafting'. 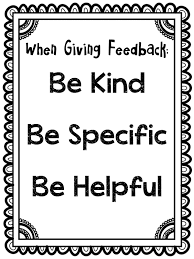 When we give feedback on the learning of other children, we make sure that should 'Be Kind, Be Specific, Be Helpful'. Through the school, we have a number of children that belong to 'The Critique Crew'. Amongst their responsibilities, they look at the nominees for the end of term 'Bellamy Award' and then choose the winners for each class.